Artisanal coffee roasted daily in Old Town Alexandria. Some things deserve time, care, and attention to detail. 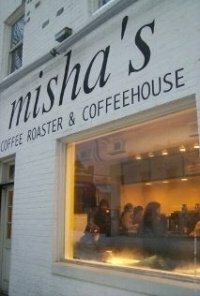 At Misha’s, we think coffee is one of those things. Our beans are hand-picked, hand-roasted in small batches every day, by a master (and mistress) roaster. All those steps really do make the best coffee you’ll ever have. That’s not hyperbole – it’s true. The coffee will draw you in and bring you back, as will the neighborhood atmosphere, the great location (right on the corner of King and Patrick Streets) and a selection of fantastic pastries and other baked goods from local providers.